Update: Follow-up blog entry on this subject Aug 7,2010. Unbelievably, when I tried to login to Edublogs.tv, I was automatically forwarded to the Edublogs.org site. Imagine the shock…all my videos/audio, gone. Without notice. Maybe that was in the terms of agreement, maybe it was scrawled in illegible writing at the bottom of a bulletin board in Australia or somewhere down under, but wow. I searched for the notice using Google, but nothing. Only silence. What?!? 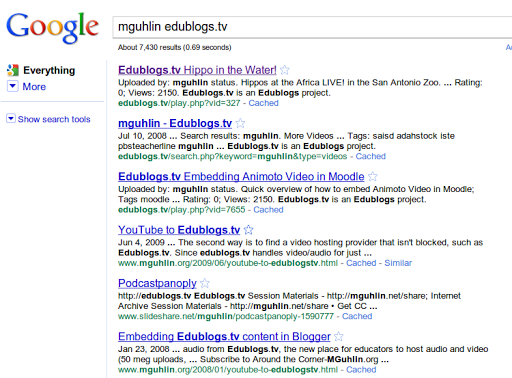 Could it be that Edublogs.tv has been shut down without so much as an announcement? I know it existed, having trusted Edublogs.tv with multiple audios and videos…now, they are all inaccessible! Is this what living in the cloud is like? Unbelievable that Edublogs.tv should close its door without a general announcement…or did I miss the news posted on a bulletin board in some other country? Is no one else experiencing the loss? The real beauty of Edublogs.tv was that it offered a place to host audio AND video for educators. Now that service is gone, leaving a gaping hole. Saddened by the loss, bewildered by the lack of info (ok I’ve googled for about 10 minutes to no avail) about the closure. And, goodbye to my video and audio on that site. Sheesh. I had the same issue and all my vids are gone. Nosed around the forum and found that they had taken it down to fix – expected to pop back sometime next year. No notice given that I am aware of. Now I'm going to have to find another educational site that isn't blocked by our district. This is especially frustrating and troubling that they did this with no notice to users! When you have embedded your video to share content with others it is very difficult to go back and find all of the places to notify them, and even more problematic if you don't have the original video to upload somewhere else. Even if the service does come back I'm not sure I would trust them with my content! This is extremely poor communication for loyal users. I hope they will consider giving you access for a short time to recover your videos!